It turns out that baking is one of the favorite hobbies in the world. However, many people tend to bake treats that are not very healthy even though they are aware of that fact. If you really enjoy treats, you should know that there are much healthier versions that the regular ones. On top of that, these healthier recipes don’t contain some costly ingredients and they are not very difficult. A healthy recipe that is becoming very popular among people of all ages is sweet potato brownie recipe. These sweet potato brownies are paleo-friendly, vegan-friendly, free of gluten and what is even more important – very tasty! 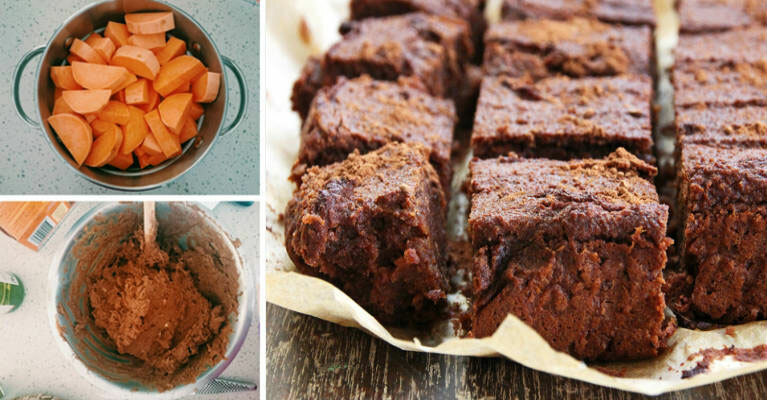 The recipe for sweet potato brownies that we will share in this article contains natural sweeteners which are a safe alternative to artificial sweeteners. But is there anything else that makes this recipe healthy? In case you want to reduce the intake of sugar and you love sweets, the taste of sweet potatoes will probably make you feel guilty, but the truth is that sweet potatoes are great for people dealing with type 2 diabetes despite their relatively high Glycemic index. Anthocyanin is a compound that gives the specific color of sweet potatoes, but this compound also provides excellent anti-inflammatory effects. The benefits of this compound are felt the most in the nerve tissue and brain. In addition, sweet potatoes are packed with vitamin C and vitamin A, which means that they are ideal for the immune system. Sweet potatoes also contain vitamin B1, B3, B2 and B6. Finally, sweet potatoes are loaded with copper, manganese, fiber, potassium and phosphorus, compounds that support the work of the digestive system, keep our blood safe and support our overall health. Now here’s another fun fact – maple syrup comes with more than 50 antioxidants that protect the body from the negative effects of free radicals which often result in cancer and diabetes. ¼ cup of cocoa powder. Turn on your oven to 350 degrees to preheat it. Take a small loaf or cake pan and grease it. Take the nut butter and pour the maple syrup and melt it on the stove. Take a large bowl and pour the melted nut butter mixed with maple syrup, mashed sweet potato and cocoa powder and mix everything well. Put the chocolate chips. Take the mixture and pour it in the greased pan and bake for about 20 minutes until you noticed that the mixture is cooked evenly. Remove the pan and wait until it is completely cooled before slicing it and storing it in the fridge. The sweet potato brownies taste great when they are cooled properly. Keep them in the freezer or fridge and enjoy this delicious healthy treat.